In this Elysee Portiere Right tapestry, we see the work based on the original Beauvais tapestries commissioned by Empress Eugene, wife of Napoleon III. The Beauvais manufacture was a powerhouse of tapestry production after the Gobelins, under the direction of Jean-Baptiste Colbert, the financial minister for King Louis XIV. 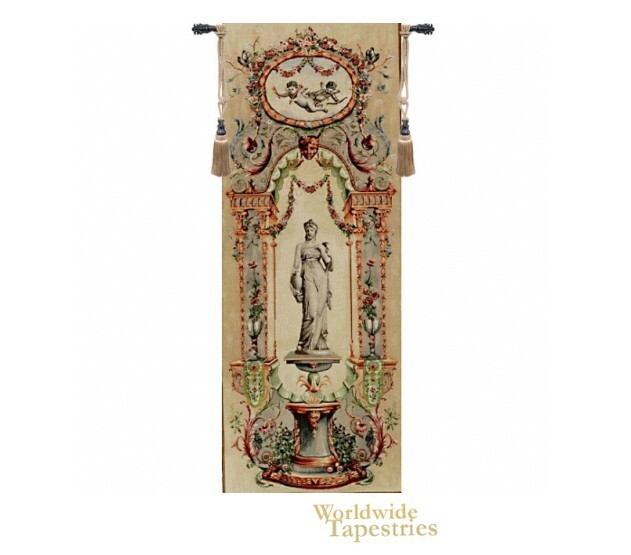 The Beauvais manufacture produced beautiful tapestries and wall hangings, and this work shows their classic style. Here we see a statue of a Greek goddess on a pedestal, columns, and an archway. There is an abundance of floral flourishes all around the statue, including in the wall above which includes a painting of cherubs flying among the clouds. The flow of the natural garlands provide gorgeous detail. This Elysee Portiere Right tapestry is backed with lining and tunnel for easy hanging. Note: tapestry rod and tassels, where pictured, are purchased separately.